The Philatelic Union Catalog, hosted by the American Philatelic Research Library, allows you to search the holdings of multiple philatelic libraries simultaneously. The catalog contains records for books, journals, auction catalogs, and other library holdings. The types of materials included and level of comprehensiveness vary by library. The Philatelic Union Catalog is part of the Philatelic Librarians Group, which also includes the Philatelic Librarians Roundtable (held both in person at stamp shows and by conference call) and the Philatelic Library Forum, an online discussion group. You don’t need to be a librarian to join; the group includes library trustees, volunteers, and staff, as well as others interested in philatelic libraries and literature. In addition to the library holdings, the union catalog also includes journal article records. The majority of these come from PHLNDX, compiled by Gene Fricks. The journal article records are provided as a research resource. The libraries in the union catalog may or may not hold the journal issue containing a specific article. In order to determine if a library has the article, search the catalog for the journal title. Lending policy: The APRL lends books directly to members, and to others through interlibrary loan. Photocopy, fax, and scanning services are available. Collections: The APRL has one of the world’s largest and most accessible collections of philatelic literature. The collection includes books and journals about stamps and postal history, as well as the history of philately and related subjects like transportation and geography. Lending policy: The CCC Library lends books only to members in good standing. There is no participation through interlibrary loan. The library is open to others by appointment only. Collections: The CCC maintains a large collection of U.S. and worldwide philatelic literature. The collection includes books and journals about stamps and postal history, as well as the history of philately and some related subjects. Book: Rare Book items are library use only; all other items are available for borrowing by members unless otherwise noted. Lending policy: Books in the main library reading room circulate to members of the Collectors Club only. Limited photocopy, fax, and scanning services are available. 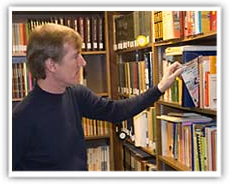 The Collectors Club Library is an all-volunteer effort. Collections: The Collectors Club Library collection includes books and journals about stamps and postal history, as well as the history of philately. Lending policy: The HSPL does not provide an interlibrary loan service. Arrangements for photocopying or scanning of items that are unique to this collection might be possible. Visits to the library, except for members of recognized user groups, are by appointment. 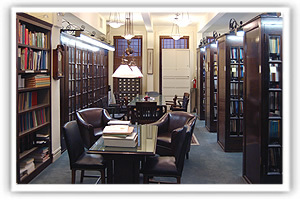 Collections: The library houses approximately 5,000 books and 300 journal titles. to support the basic needs of the Greater Toronto area philatelic community with definitive works on important collecting areas and the most recent general catalogues. Lending policy: Most library material circulates, except items with call numbers that begin with HIST [Historical], REF [Reference], and PER [Periodicals]. Check-out privileges are extended to NWPL members in good standing, as well as members of affiliated groups. Items may be checked-out in person or by mail. 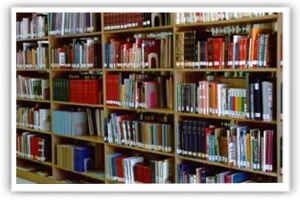 NWPL also participates in an interlibrary loan program for non-members; fees apply. Details may be viewed here: www.nwpl.org/CheckoutPolicy.html. 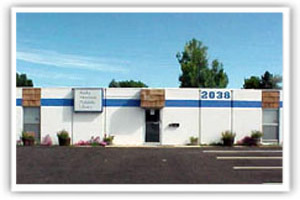 Visiting Information: The NWPL is located on the lower level of the Oregon Stamp Society clubhouse and is open during most club functions and by appointment. We welcome all collectors, dealers, and members of the public. Staffed by volunteers, the Northwest Philatelic Library celebrates its 10th year of service as a non-profit organization in 2013. Lending policy: The Slusser Library collection does not circulate. However, photocopy, fax, and scanning services are available. 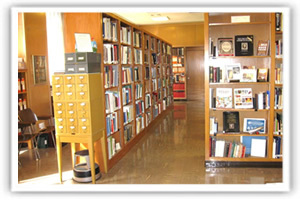 Collections: The Slusser Library houses over 30,000 books, journals, catalogs, photos, maps, and other reference items related to worldwide postal and philatelic history. The collection has a particular focus on the postal history of Arizona. In addition, there is a sizable collection of Civil War material, including books, photos, and artifacts. Arizona Postal Documents Collection, which contains original postal documents from a number of Arizona post offices. Tucson Post Office Administration and Public Relations Collection 1950-1980, which contains documents and photographs relating to the Tucson postal service and local postal promotional campaigns. Lending policy: The RMPL lends books to members ONLY directly or through the internet. The RMPL does NOT engage in interlibrary loan since we rely for all our work on volunteers. Photocopy and scanning services of books and periodicals are available through our on-line catalog coordinator. The RMPL has a collection of worldwide philatelic literature. The collection includes books and journals about stamps and postal history, as well as the history of philately and related subjects. Auxiliary Libraries: The RMPL houses the libraries of the following libraries that are administered by the societies themselves. Their holdings are not included in the catalog of the RMPL. Great Britain & Commonwealth Collectors Club of the U.S. Visiting the library: The RMPL is a completely volunteer organization, open 36 hours per week. Our membership consists of 500 members from throughout the United States and a small foreign contingent of 10 members. Our 6,600 square foot facilities (2 buildings) are open to all visitors and we welcome all newcomers to our library. Stamp collecting visitors and their families are welcome to enjoy the gardens at the RMPL maintained by an RMPL volunteer. We hope to see you here whenever you’re out seeking the great American West. Lending policy: Items may be consulted in the library. 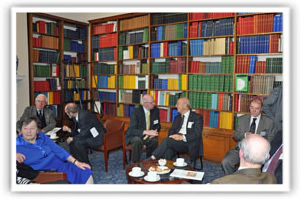 The Society's Library is among its most significant philatelic assets. It contains an unparalleled collection of philatelic literature from all over the world. The library material is currently housed in five locations on three floors in the Society's building. A member of the Library Committee maintains each of the major sections on a voluntary basis, supported by the secretarial staff and the House Manager. Bibliography: including library catalogues and indexes. Monographs and Handbooks: subdivided into sections for Great Britain, Commonwealth, foreign countries and general philately. 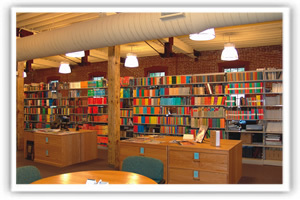 Many specialist volumes are limited editions and of considerable value to researchers worldwide. Periodicals: Periodicals published in English and foreign languages are held in nearly complete or complete runs in a comprehensive collection of the world's general and specialist publications which would be impossible to assemble today. 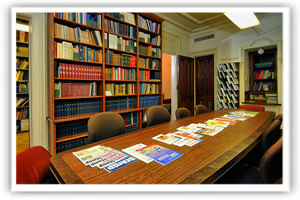 The Society receives copies of up to 300 periodicals each year with 2,400 titles held, the earliest dating from 1879. Exhibition Material: produced by the organisers of all major international, UK national and other specialist meetings. This provides valuable information on events generally, lists of exhibitors and awards made. The literature frequently includes philatelic information and articles not available elsewhere. Library Books: The Society uses a library cataloguing system called Heritage and this now includes all books held at 41 Devonshire Place with around 14,000 volumes listed. Searching the Catalogue will allow philatelic bibliographies to be shown for any search terms entered. Jonathan Cartwright and his team are continuing to develop this resource which will now be searchable at home by all members. Library Stamp Catalogues: More than 2,250 stamp catalogues are available for research ranging from 1861 with Alfred Potiquet's illustrated stamp catalogue, which was the first in the world. to the present day. Stamp catalogues published by Stanley Gibbons in a nearly complete range from the early 1900s. Good runs of other internationally-recognised catalogues published abroad are also held. These provide information for a wide range of collecting interests. Auction Catalogues: We have an extensive collection of auction catalogues with over 13,500 catalogues, including named and general sales from more than 250 auction houses. 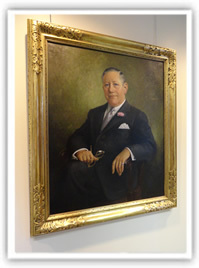 The strength lies in the period from the 1930s but some date back to 1872, with not only British sales but with strength in European and North American auction houses. Within the RPSL Catalogue information includes the name of the auction house, the location of the auction and the date. The names of vendors and the subject-matter (e.g. country or theme) of the sales are included in many instances. Other: Other research material including articles, personal research notes, copies of collections and displays, Commonwealth gazettes and Post Office guides. All of these are consulted from time to time during the course of a research project. 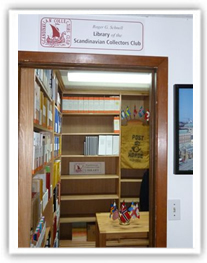 Lending policy: Members of the Scandinavian Collectors Club in good standing may borrow materials from the library. More than 2,000 books and catalogs related to philately in the Nordic region that encompasses Sweden, Denmark, Norway, Iceland, Finland, Greenland, the Faroe Islands, Åland, and the one-time colony of the Danish West Indies. The collection also includes hundreds of Scandinavia-related philatelic periodicals and articles, some 70 audio-visual presentations, and copies of numerous exhibits, auctions, and show catalogs associated with Scandinavia’s stamps and postal history. Visiting the library: The library is housed in two rooms inside the main building of the Rocky Mountain Philatelic Library (but is a separate entity from the RMPL). 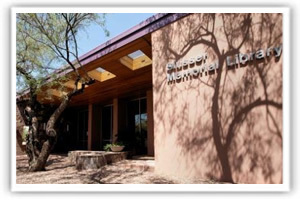 Visitors may view the SCC Library when the RMPL is open, but only SCC members in good standing may borrow materials. SCC volunteers are at the library regularly on Wednesday mornings and occasionally on Saturdays. Address: 2 Massachusetts Avenue NE, Washington, DC 20013. Lending policy: The NPM lends books directly to Smithsonian employees, and to others through interlibrary loan. Photocopy, fax, and scanning services are available. Although the resources at the National Postal Museum Library focus on the postal history and philately of the United States, the collections are international in scope. More than 6,000 books, 7,000 serials, manuscripts, photographs and many auction and stamp catalogues. Annotated copies of the Catalogue of the Philatelic Library of the Earl of Crawford, K.T. Catalogue of the Royal Philatelic Collection. Visiting Information:The NPM library is open Monday through Friday from 10:00 AM to 4:00 PM. It is mandatory to call ahead of a visit to make an appointment and confirm that the opening schedule is not affected by a vacation or holiday closure. The NPM also welcomes visitors to its monthly public open house on the third Saturday of every month. The collection is located in the staff access-only portion of the museum, so visitors will be escorted to and from the library. Address: 241 Wellesley Street, Weston, MA 02493. Lending policy: The Spellman lends books through interlibrary loan. Photocopy and scanning services are available. 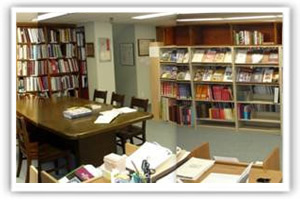 Members and visitors may use the literature collection in the library. The Spellman has an extensive collection of philatelic literature. The collection is international in scope and includes books and periodicals about stamps and postal history, as well as the history of philately and related subjects. Books and periodical holdings are indexed separately. The Spellman also has extensive worldwide collections and exhibits of stamps and postal history available to members and researches for reference and study by appointment. Visiting Information: Thursdays to Sundays, Noon to 5:00, Or by appointment. Library Address: 3004 Spring St. Lending policy: The WPL lends books within the U.S. Photocopy, fax, and scanning services are available. The WPL has a very extensive collection of philatelic literature. The collection includes books and journals about stamps and postal history, as well as the history of philately and related subjects like transportation and geography. The collection is open to the public, and may be used within the Special Collections reading room. Patrons who borrow items through interlibrary loan (ILL) may use them on the premises of the borrowing library. We approve ILL requests on a case-by-case basis, and some items may be too fragile to mail. See this page for more information about borrowing through ILL. Collections: Among the collection's strengths are holdings in U.S., British, Western European, and Mexican philately. There is good coverage for the British Commonwealth as well as South America. The collection has especially fine holdings in Confederate postal history. Other important areas include detection of forgeries, postal histories of U.S. states, and air mail philately. The library is also home to the records of the Texas Philatelic Association, Inc. 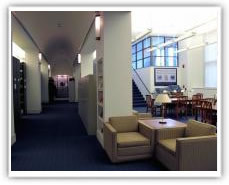 The collection is located on the third floor of the Eugene McDermott Library, in the Special Collections department; see this page for the library floor plan. Visitors who aren’t affiliated with UT Dallas can get a free one-day visitor parking pass at the campus Visitor Center; see the UT Dallas Parking webpage for details. See the library’s Information for Visitors page for driving directions, a campus map, and details on the library’s services and policies. If you have any questions, contact APRL staff by submitting a message or call 814 933-3803 ext. 246.